Providing cash flow solutions and invoice factoring to businesses in: Seattle and cities throughout Washington and Oregon. Riviera Finance is an invoice factoring company providing the following services for companies in Seattle and throughout Washington and Oregon. As well as, all other cities throughout Idaho, Montana and Alaska. Nothing is more expensive than lost business. In the spring of 2012, an IT services company based in Kirkland, WA landed its first engagements with Amazon and Nintendo. Recognizing the added personnel could create a biweekly payroll cash crunch, the client approached a number of factoring companies to compare options. Banks were in a state of retreat, offering prohibitively small credit limits. The client did not want to dilute equity by taking on additional investors. After entertaining five different proposals, Riviera Finance was selected due to its financial strength, credit rating, program flexibility and simplicity, its 42 years in business, and also based the strength of its client recommendations – all areas where our competitors often come up short. In exchange, Riviera Finance has given the client total expansion flexibility, enabling it to add new staff at a moment’s notice. This in turn has led to an increased level of engagement with both Nintendo and Amazon, as their respective project managers have witnessed the client’s ability to seamlessly supply new, highly qualified, well paid staff to its most important IT projects on short notice. 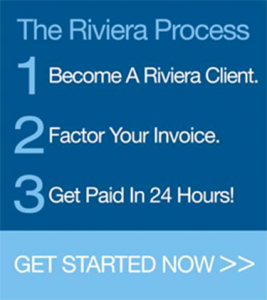 Riviera Finance helps owners spend far less time navigating cash flow issues, freeing them up to focus on the “business” side of their business.